THE SUING OF THE PROPHET OF ISLAM…….AND HIS DESCENDANTS – The Tundra Tabloids……. “A virtual think tank about multiculturalism in Denmark. Eticha is independent of party politics and religious affiliations. Eticha is a virtual network where a variety of active individuals contribute knowledge and other resources on a case by case basis. We are always interested in involving new persons and new ideas. While our politicians with their usual lack of proportions keep discussing halal food in schools, burqa, niqab and hijab, the fragmentation of our societies continues apace. This is described in detail in the book “Et delt folk” (“A Divided Nation”, published summer 2008) by Morten Uhrskov. In spite of the general openness of Danes, the launchers of Eticha are not yet seeing the necessary debate of Denmarks future “in the light of change”. We believe the ‘caleidoscopical’ composition of society – multiculturalism – makes it difficult to formulate new visions acceptable to everyone. The number of people who doubt the ability of politicians to direct developments in our common interest is ever increasing. We no longer believe that the current societal structure can be preserved, due to the extensive demographic shifts taking place in Denmark and in Europe. In order to uphold a workable society, we all need to follow the same rules and take part in contributing to the community. Eticha informs lawyer Faizal Yamani of upcoming lawsuit against Muhammad’s descendants Supported by a number of Danish and foreign associations, the virtual network Eticha is planning to sue the Muslim prophet Muhammad’s descendants, the group preparing a libel case against a number of Danish newspapers. 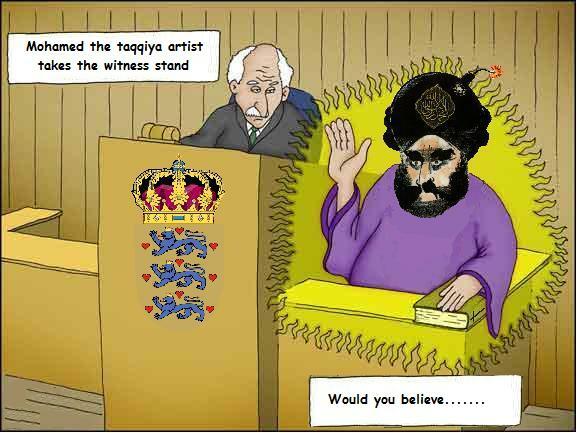 It all began when Jyllands Posten in September 2005 published the now famous Muhammad cartoons. After half a year of boycotts, flag and embassy burnings, and various diplomatic crises between Denmark and the Muslim countries, we thought it was over. But no, nay, never! In the spring of 2008 the CIA revealed a plot to murder Kurt Westergaard – the cartoonist who had placed the bomb in Mo’s turban, and thus created the greatest symbol of “freedom of speech and expression” yet in this century. The Danish newspapers reprinted the cartoons to show solidarity with Kurt Westergaard, which got the ball rolling. In august 2009, Faizal Yamana demanded an unconditional apology from the 15 newspapers to be published in various media across the world, in four different languages. By reprinting the drawings – and especially that of Kurt Westergaard – the newspapers had, according to Faizal Yamani, made themselves guilty of slander against the Muslim prophet Muhammad ibn ‘Abd Allah al-Hashimi al-Qurashi. Consequently, Hans Erling Jensen of Eticha.dk, sent his now famous letter to the law firm, where he drew attention to Denmark’s position in history and in the world. But little did it help. Lawyer Yamani claims to represent 94,000 people, all descendants of Muhammad ibn ‘Abd Allah al-Hashimi al-Qurashi, who demand an apology for the insult (they claim) their ancestor was subjected to by the Danish newspapers once again publishing the infamous cartoons. Faizal Yamana intends to open a libel case in London against the Danish newspapers. Not that he expects to win it, he is too well educated to even dream of that. On the other hand, he has funding from a very wealthy foundation whose, objective is to protect Muhammad’s reputation at any cost. This libel case therefore constitutes nothing else than economic blackmail. One newspaper, Politiken, has already done the bean-counting, caved, and apologized. At Eticha.dk, we presented a new plan. Due to Yamanis’ unethical initiative targeting the Danish newspapers, there was an obvious opportunity to countersue Muhammad’s descendants, to one time for all obtain an apology from people as closely related as possible to the source of the outrageous accusations, slander and the consequences of these statements that generations of innocent and defenseless people have suffered for (the Koran). In contrast to Mr. Yamani, we have a solid case, and now we even know exactly who to target with the lawsuit, that we can achieve justice. I am writing to you after being notified that your legal firm represents 94.000 descendants of the prophet Muhammed ibn ‘Abd Allāh al-Hashimi al-Qurashi in a libel suit against several Danish newspapers. It is a relief to learn that the descendants of Muhammad have a representative, to whom we can raise our claim on behalf of people verbally vilified and physically attacked by the adherents of your religion. This year alone, we have been contacted by a large number of individuals and organizations who are of the impression that you and your clients are not disposed to change your attitudes with regard to the scripture that Muslims allege to be Allah’s words to Muhammed ibn ‘Abd Allāh al-Hashimi al-Qurashi. You and your clients apparently continue to insist that Muhammed ibn ‘Abd Allāh al-Hashimi al-Qurashi may not be portrayed or caricatured. This implies that you and your clients give your unconditional support to the text of the Quran, as it exists today, as well as to the Hadith that, combined with the Quran (and the Sirat) form the basis of Islam and Sharia. The descendants of the people whom your clients’ forefather compared to apes, pigs and rats, and whose case we now represent, feel not only personally insulted, but also emotionally aggrieved by these denigrations, as their own ancestors have been ridiculed, persecuted and expelled from their lands, since the Quran and Hadith imply that non-Muslims are the enemies of Allah and therefore were and are to be treated as outlaws. Due to the fact that Muhammed ibn ‘Abd Allāh al-Hashimi al-Qurashi claimed, that not he, but Allah was the author of this insult and thus ascribed the saying to him, we find this not only blasphemous but also a thinly disguised attempt to decriminalize Muhammed ibn ‘Abd Allāh al-Hashimi al-Qurashi’s own misdemeanors. This will possibly be addressed in a later court case. With regard to the above, we request you to contact Muhammed ibn ‘Abd Allāh al-Hashimi al-Qurashi’s descendants, to demand an unconditional rejection of and an apology for a series of statements and verses in the Quran and Hadith which the said descendants must remove. This includes articles on the world wide web and all new editions of the Quran, Hadith and Sirat. We also demand that you before the termination of the year 2010 on behalf of Muhammad ibn ‘Abd Allāh al-Hashimi al-Qurashi’s descendants publish a clear and unconditional correction of and apology for the long series of gross insults, violations and persecutions of an immense number of people of other persuasions resulting from Muhammad ibn ‘Abd Allāh al-Hashimi al-Qurashi’s koran and its influence on his uncritical proselytes. The corrections and apologies must be published globally with press-releases in English, Arabic, French, Spanish, Portuguese and Russian. We are acquainted with the fact that your legal firm has previously produced texts for this kind of apology and have therefore no hesitation in allotting this task to you and the descendants of Muhammad ibn ‘Abd Allāh al-Hashimi al-Qurashi, in conjunction with whom we are confident you will produce a suitable document. Regarding the apology and the desired corrections in the Koran we imagine that the affair will have such high news value that it not will be necessary to make specific demands on which media are to be employed. We have confidence in the media’s own ability to administrate and disseminate this fitting gesture from Muhammad ibn ‘Abd Allāh al-Hashimi al-Qurashi’s descendants. If you fulfill our demands before ultimo December 2010 the involved parties I have been in contact with will relinquish all further demands on Muhammed ibn ‘Abd Allāh al-Hashimi al-Qurashi’s descendants and proselytes. Here in Eticha we are at your disposal for any further information that may be necessary. I would appreciate an answer from you at your earliest convenience – though not later than 60 days from today’s date – informing me as to whether your clients intend to fulfill the above mentioned demands or can suggest a compromise worth discussing. If your clients – contrary to our expectations – decide not to collaborate, we reserve the right to initiate a global process of which the principal aim will be a court case against your clients for breach of compliance with international law on hate-crimes, incitement to persecution of dissidents and incitement to committing genocide. Previous Post Previous Post NORWEGIAN BLOG NORWAY ISRAEL AND THE JEWS PICKS UP THE TT’S NRK-GATE STORY…….